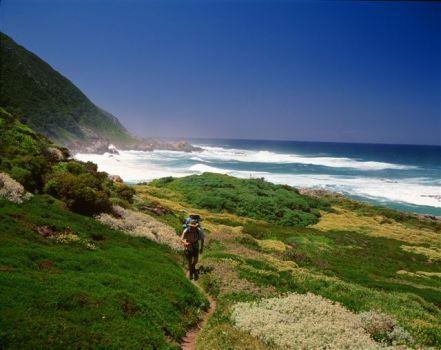 As its name suggests – so invitingly, the Garden Route hamlet of Wilderness is surrounded by nature in some of her best finery. Snaking its way between the Kaaimans River and the Goukama Nature Reserve, Wilderness lays claim to a great big scoop of nature. Natural lakes and lagoons, and a long and relatively untrampled expanse of beach are some the natural eye-candy in Wilderness. The 2500 hectare Wilderness National Park has bestowed on Wilderness five rivers, five lakes, two estuaries and 18 kilometres of picture-perfect coastline. Birds are plentiful in this exquisite waterworld. The laid-back town is the perfect holiday-den for visitors to the Garden Route. It’s positioned near George, not too far from Mossel Bay, and a breathtaking drive away from Knysna, Plettenberg Bay and The Crags. Day-trip to Knysna and Plettenberg Bay, to hike in the Robberg Reserve, or visit Monkey Land, the Elephant Sanctuary or Birds of Eden. Activities nearby include canoeing, cycling and abseiling in Kaaimans Gorge. Recreational activities in Wilderness include hiking, mountain-biking, bird- and whale-watching, hang- and paragliding, horseriding, scenic drives, day tours, angling, boating and other water sports. Map of Africa offers stunning views of forests, lakes, mountains and coastline; and Dolphin’s Point is an excellent vantage point from which to see whales and dolphins. A prime photograpgy spot is Kaaimans River Bridge. Woodville Big Tree is over 800 years old and creates a fabulous picnic spot beneath its massive branches. Stay at Palms Wilderness Retreat on the basis of a fabulous special offer available until 30 April 2013. 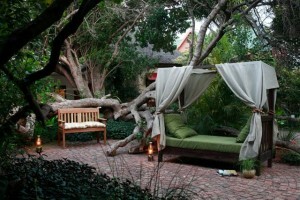 R760 per person per night sharing gets you four-star accommodation on a bed and breakfast basis. Enjoy the comforts of air-conditioning and / or fans, high quality linens, electric blankets, snug bathrobes, in-room bar fridges, and hot beverage-making stations. All the rooms are en suite and have private entrances into the gardens. The indigenous gardens are pretty and tranquil, inviting the odd hour spent in a lounger amid ponds and fountains. The beach is a five-minute walk from here. Dine out at your choice of several restaurants in town. 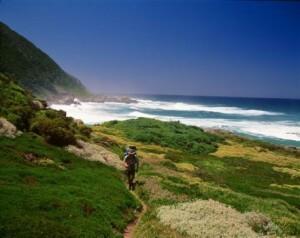 Surrounding Wilderness are the towns of Knysna, George, Oudtshoorn and Mossel Bay. George is 10km west of Wilderness; Knysna is a scenic drive of about 50km away; Mossel Bay is 70km from Wilderness, where you can visit the Diaz museum, and Seal Island well known for its great white sharks. Mail us for information and bookings or call +27 21 797-7122.